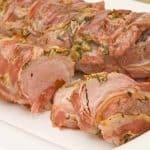 Italian porchetta is, by definition, a roast suckling pig that is slow cooked and flavored with fresh herbs and garlic. 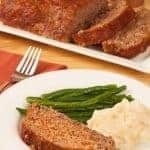 The concept has been adapted to various cuts of pork, from shoulder to loin, but we incorporated some of the basic flavors into a meatloaf recipe that is as delicious as it is simple. Try serving it with a side of penne tossed with cabbage sautéed in olive oil (see notes). 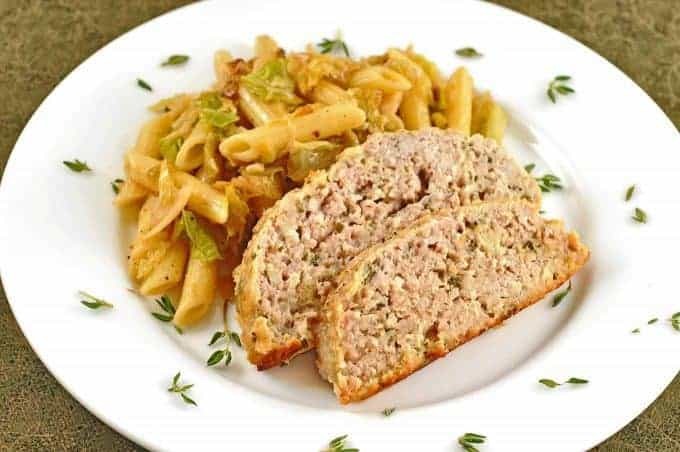 A meatloaf inspired by the flavors of a traditional Italian recipe for roast pork made with garlic and fresh herbs. Preheat the oven to 325°F and coat a shallow oblong baking dish with nonstick spray. Combine the bread crumbs, half-and-half, sage, thyme, rosemary, garlic, fennel seeds, salt and pepper in a large bowl. Add the eggs and whisk with a fork until light and well blended. Add the ground pork and, using your hands, mix gently until just combined. The mixture will be rather wet. Turn out onto a sheet of wax paper and form into a loaf about 5 x 12 inches. Transfer to the baking dish, smoothing and reshaping if necessary. Bake for 45 minutes, or until the meatloaf reaches an internal temperature of 160 °F. 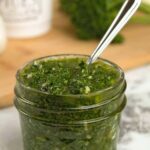 Try to use fresh herbs if possible, but if you do use dried, reduce the quantities to 1 teaspoon each on the sage and thyme and 3/4 teaspoon on the rosemary. Heat the olive oil in a large skillet over medium heat, add the garlic and cook until fragrant, about 1 minute. Add about half of the cabbage, cook until wilted and soft and season with salt and pepper. Add the remaining cabbage and continue cooking, stirring occasionally, until tender and very lightly browned, about 15 minutes. Taste and adjust seasoning if needed. While the cabbage is cooking, cook and drain the penne according to package directions. Toss with some extra olive oil, season with salt and pepper and combine with the cabbage. Transfer to a serving dish and top with grated cheese. 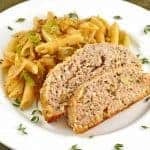 We adapted our Orecchiette with Savoy Cabbage and Bacon, a main dish pasta recipe, to serve as side with this meatloaf. 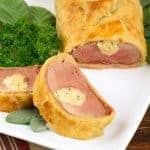 Because we were serving it with meat, we wanted to lighten it up, so we omitted the bacon and butter and used olive oil instead.